Creating a classroom culture of inquiry is getting better and better every September in most ways. It’s especially working well to reassure the students with little previous physics experience, to excite the students with previous unpleasant experiences with physics, to challenge the students who found previous physics classes boring or stifling, and to empower students who’ve been marginalized by schooling in general. Those are the students who have been dissatisfied with their previous learning. Perhaps for the first time, someone besides them is honouring their dissatisfaction. Seeing them thrive, as their resistance to authoritarianism becomes their learning’s rocket fuel, gives me hope for human survival. But one thing I’m still struggling with is responding well to the students who have been taught to uncritically regurgitate “correct” answers — and who’ve embraced it. You know — the “good” kids. I don’t know what to do with them. I’ve been prioritizing the needs of the students who’ve been punished and rejected by school systems, by entering together into a conversation of curiosity, intellectual humility, peer support, excitement about the generative potential of not-knowing, and co-construction. I don’t regret that. But the students who’ve been praised and rewarded are also my students. The hands-waving-in-the-air students trying so hard to impress me, the students vomitting strings of polysyllabic nonsense, the ones for whom it is a satisfying game and maybe even a noblesse obligé to expose other answers as “wrong” and shameful… preferably with urgency, by interrupting and talking over others, as if something terrible might happen if “wrongness,” or even simply an alternate theory, was allowed to exist for a second longer than necessary… the ones playing the “guess what the teacher wants to hear” game, or its sibling, “try-to-make-the-teacher-look-stupid-and-wrong” (distinguished only by whether they decide that the “correct” authority is me or someone else), the ones who are willing to disregard what they see with their own eyes or know in their own bodies so they can publicly proclaim their alignment with “correctness,” make me want to cry and get drunk and fear that a descent into fascism is inevitable. They will need their own kind of support if they are ever going to be technicians — and for that matter, if they are ever going to stop derailing their classmates’ learning. They too have resistance and defiance and dissatisfaction that they can use for fuel. And I’m failing. Because when I interact with these students, I feel dread and despair. I’m usually able to take them aside and have a quiet conversation after class, asking about them, what they care about and are interested in, what they’ve learned in the past, what they’re curious about… and use that to lead in to a question about how they too have responsibilities to help make room for everyone’s curiosity. But sometimes even that’s not enough, and they go on squashing or shaming or patronizing or interrupting. How do I get curious about their ideas when I’m afraid to scratch the surface, for fear that what’s just underneath is a culture of supremacy? How do I find my way in to supporting them? My conflict mediation coach suggests finding out what need they are meeting with their “correctness-seeking” behaviour. What they get from that experience that they’re not getting elsewhere. So far, no question I’ve asked has had much success in yielding that information. I’m also afraid of the effect they have on the other students. Their dismissive insistence that other people’s theories are “wrong” can quickly undo weeks of carefully cultivating a spirit of exploring, evaluating the evidence ourselves, and being ok with uncertainty or provisional ideas; their pat answers to other people’s questions make it seem like it’s stupid to be curious at all. I have a bunch of options here… one is an activity called “Thinking Like a Technician” where I introduce the idea that “believing” is different from provisionally accepting the theory best supported by the current evidence. I show the Wikipedia page for atomic theory to draw out the idea that there are many models of the atom, that all of them are a little bit wrong, and that our job is to choose which one we need for which situations. Since none of the ideas are perfect, we can’t and don’t have to figure out which one is “right.” That seems to help a bit, and give us some points of reference to refer back to. I show a video with Malcolm Longair and Michio Kaku explaining that atoms are made of mostly nothingness. But I think it makes it worse. The students who are excited get more excited; the ones who feel like I’m threatening the authority of the high school physics teachers they idolize get even angrier and more defensive. For the rest of the class, it’s wonderful — but for this subset, it’s uncomfortably close to Elicit-Confront-Resolve. They experience it as a form of “expose-and-shame“, and unsurprisingly they retaliate. If they can’t find some idea of mine to expose and shame, they’ll turn on the other students. Something I’m trying to improve: How do I help students re-evaluate things that seem solid? It’s not just that they respond with defensiveness; they also tend to see the whole exercise of inquiry (or, as some people call it, “science”) as a waste of time. We literally can’t do science if we are so uncomfortable with “not-knowing” that we run around slapping pat answers on every question like some depressing game of whack-a-mole. What could make it worth re-considering assumptions and evidence when you’re that sure? What happens when we apply this line of thinking except that, instead of defensive students learning about physics, we are talking about, say, defensive straight people learning about LGBTQ+ rights? Is it different when we apply it to people defensively trying to prove that they already know everything about gay rights, vs. people defensively arguing that they’re already sure that gays shouldn’t have rights in the first place? ooh great topic…I’ve struggled with this as well, so I’d love to hear what people think. I think it sort of depends on what kind of “knowing the right answer” you’re dealing with; sometimes in my inquiry classes students use the “correct” technical terms (“current, voltage”) before we’ve established a shared meaning. For those students I often ask “what do you mean by that”, and try to get them to explain it in terms that make sense to everyone. Often they can’t, and so it becomes just another idea to consider, not “the answer” accepted by the class. But sometimes they *can* fill in the answer in a way that makes sense. I’m not sure what to do then, but one thing I try is to ask them to fill in the details of a tricky aspect of the phenomenon and get them thinking about that (*why* do you need a complete circuit to get a current? once you connect the battery, *how* do the electrons first get going?). 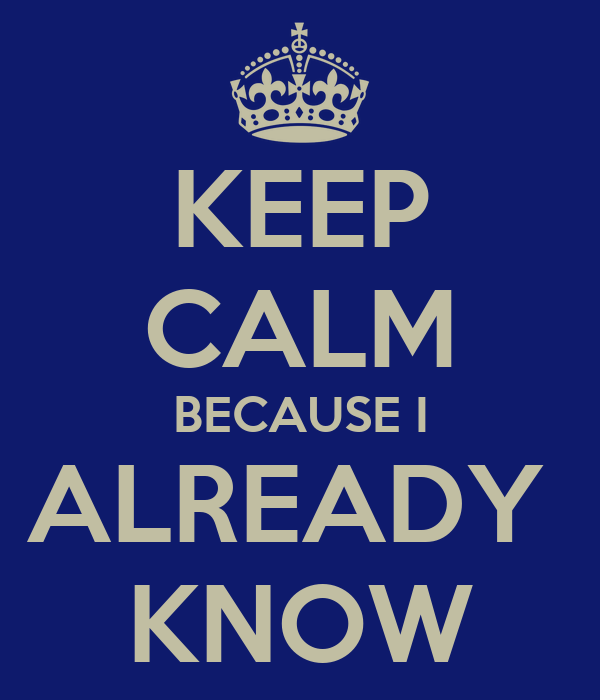 I see what you mean — there are a lot of different kinds of “I already know this.” Maybe we need a taxonomy? An example of the kind you’re mentioning that often happens is the people use the word “short” or “shorted” to mean “broken” in a sort of general, unexamined sense. In this particular case, I’ve got students who’ve taken honours Gr 12 physics, and others who don’t know what an atom is exactly. (I teach in an open access community college; the only entrance requirement is high school graduation, so the range is huge). So the students with lots of background knowledge actually can go on at great length about current, for example, and are quite happy to lord it over the other students with lots of long words, often in an exasperated and borderline contemptuous tone. As you can imagine, that creates a “chill” among the rest of the students who have a pretty strong disincentive to question these “authorities” lest they appear to be just as “stupid” as the experienced students seem to be implying they are. I can address the attitude — we agreed as a class that we have a responsibility to go behind not putting each other down, and to instead support each other and pull each other up. So that often helps with the disdain. But however long it takes me to coach the “advanced” students into not using that tone of voice, that’s how long the other students have to suffer through that experience, and I can see them getting smaller and smaller in their seats each time. Partly, it really helps if I can identify the likely candidates early on and talk to them outside of class. But it’s early in the program, and they haven’t necessarily bought in yet to the idea that they have a responsibility to the class to pull together. Instead they seem to feel victimized by these “beginning” students who are slowing them down in a way that they don’t see any benefit to themselves. It’s extra tricky because the “advanced” students, despite their lingo, confidence, and internally consistent arguments, are often actually *quite* wrong, even by their own standards. *wince* They have often misunderstood even the single model they think is the “right” one (i.e. assuming that orbital shells are solid things like layers of an onion), or memorized some complicated phrase that they don’t actually understand. It’s usually when they start to get a glimpse of that possibility that they lash out. I do realize that I’m pulling the rug out from under their trust in their own perception of reality, and that’s an unpleasant experience no matter what. Sometimes I think this is actually a spiritual crisis rather than a scientific one. For the know-it-all’s a good plan is to give them some components which screw up their “knowledge”, a diode, a pre-built capacitor-resistor circuit in a box, an inductor and a low voltage AC power supply. Not much of their knowledge will help them then. In most of the electronics courses I have been involved with, at some later stage we gave them a box with two terminals and said “Now figure out what is in the box”. A simple version of this might work for these people as well.